KAMPALA – Central Bank Governor, Emmanuel Mutebile has denied allegations that his team at Bank of Uganda (BoU) didn’t carry out their supervisory roles and the oversight led to the collapse of the banks, saying the demise of the banks was due to illegal conduct of the managers of the failed financial institutions. 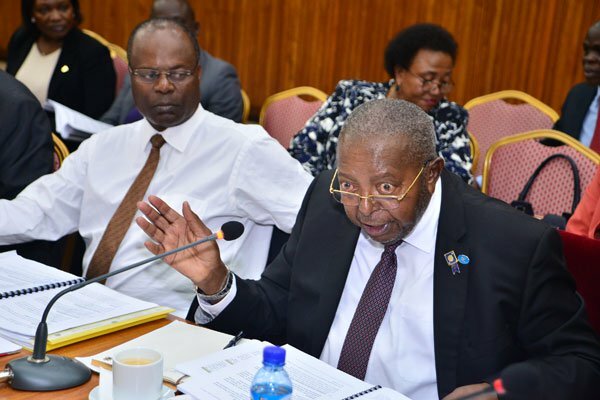 Mr. Mutebile made the remarks on Tuesday, April 2, at a meeting at Fort Portal Town Hall in Kabarole District where he said that there was no way one should put the blame on insolvency of the banks on lack of supervision from the regulator. The Committee of Commissions Statutory Authorities and State Enterprises (COSASE) recently concluded investigations into the closure of seven defunct banks including Teefe Bank closed in 1993 due to insolvency; International Credit Bank closed on September 18, 1998 due to poor liquidity and insolvency; Greenland Bank closed on April 1, 1999 as a result of insolvency and violation of certain provisions of Financial Institutions Statute; and the Cooperative Bank that closed on May 19, 1999 due to continued poor performance and non-compliance with regulatory capital adequacy requirements. Others were National Bank of Commerce closed on September 27, 2012, due to undercapitalization; Global Trust Bank closed on July 25, 2014, due to undercapitalization and corporate governance weaknesses; and Crane Bank Limited that closed shop on October 20, 2016, citing undercapitalization. Mr. Mutebile acknowledged that whereas Uganda needs more local banks, there is a need to rectify mistakes made so that the local banks don’t suffer the same fate. He highlighted the problems faced by local banks arguing that the challenges were predominantly but not limited to: Bad loans that were not fully serviced or that went unpaid entirely resulting in losses; insider loans to directors and related companies; mismanagement; misreporting; liability-asset mismatches; and under-capitalization, among others. However, he informed the guests that BoU has responded to bank failures by reforming the supervision and regulatory framework so as to identify and impose prompt remedial action ahead of time. The Central Bank boss urged that contrary to media reports that exposed weaknesses in the regulator’s supervisory roles, that isn’t the case on the global scene where Bank of Uganda has been hailed across the African continent for outstanding supervision and regulation of financial institutions with information from the Central Bank indicating that the banking sector is strong and healthy with banks possessing sufficient financial resources, and majority of the commercial banks making profits. The governor also confessed that it was sad that the most prominent news from the financial sector recently has been about the investigations by Parliament into the manner in which the central bank handled some banks that failed in the past with most of the closed banks were locally owned.